Many attempts to attack the problem of general keyboard inefficiency have been made in the past, most notably by IBM who developed a system for the stenographer called the Chordian keyboard. In addition, voice recognition, handwriting analysis, and several variations of the Dvorak keyboard (which re-arranged the letters in a standard QWERTY keyboard so that the most common letters are actuated by the strongest fingers) have all been studied. All of these methods share the same basic drawback; the user must be sitting down and anchored to a desk. 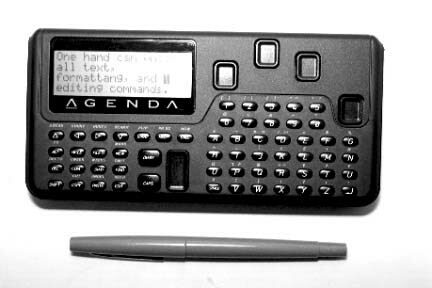 The idea for the Data Egg was inspired by a one-handed pocket organizer made by Microwriter Systems, plc., pictured below. The device attempted a brilliant work-around to the deficiencies of the Sharp Wizard and the Casio B.O.S.S. (popular pocket organizers of their day): namely, their tiny and unusable keyboards. The AgendA (as it was called in the U.K., in the U.S. it was marketed under the name, "Mini-BAT") possessed seven large buttons (three for the thumb, one for each of the remaining fingers). Pressing different combinations of these buttons, often referred to as "chording", resulted in the generation of all characters, numbers, and commands necessary to enter and extract information. The alphabet was easy to learn, thanks to clever mnemonics and other memory jobs which associate finger position with the character’s shape (see The Microwriter Alphabet). I was able to memorize the basic alphabet in about two hours. After evaluating the unit and bemoaning the fact that even this handy device couldn't be used anytime and anywhere (it required either a flat, non-vibrating surface or the use of two hands), I proposed taking the brilliant Microwriter scheme and wrapping it around a shape that's easy for the hand to hold, such as an egg. Such an embarrassingly simple modification suddenly solved many usage problems unaddressed by today's technologies. Its use became position-independent, allowing for truly portable computers to be built, and it held the promise of extending computer accessibility to the handicapped. More important, I could now write down my ideas whenever they appeared, in situations where even pen and paper would not suffice. The initial prototype was made by taking a plastic Easter egg (hence the name, 'Data Egg') and gluing seven buttons where my fingers naturally fell, plus a strap to secure it onto the hand, as illustrated in Figure 3. After months of typing on it, the egg-shaped device soon was deemed too bulky and the strap, although helpful, was a nuisance. Many brainstorming iterations took place using clay models to come up with a shape that was ambidextrous and could be held comfortably without a strap. (Figure 4 shows some of the shapes which emerged from this brainstorming phase.) One of the ideas had the keys actuated by the first joints of the fingers rather than the fingertips; this meant that a smaller shape could accommodate a large diversity of hand sizes and make the device both easier to hold and less cumbersome to carry. This concept eventually led to the development of the 'Data Beeper', shown in the photo below. The beeper consists of an old hollowed-out Motorola pager with customized finger buttons along its long edge and three buttons on top for the thumb, one of which is actuated by the thumb's first joint. On the top deck are two LEDs for feedback (there was insufficient room for an LCD readout in this version), and an On/Off switch. On the bottom is a 4-pin serial port so you can squirt your ideas over to your personal computer for further polishing once you return to your office. The idea has gone through many iterations, improvements, and there have even been books published containing the ideas captured with the device by the Egg's inventor, Gary Friedman. In the early 1990's, a company in Sacramento called InHand Development Group was to have taken the idea and brought it to market; however the company was not able to meet any of its deadlines, control of the idea was lost, and the project has officially been dropped. This web site is the first step to reviving the idea, generating support, and spreading enthusiasm for a device whose time came several years ago, although nobody seems to have noticed that modern pocket organizer keyboard are all but unusable! The egg finally makes it possible to use a Personal Computer with one hand instead of three.